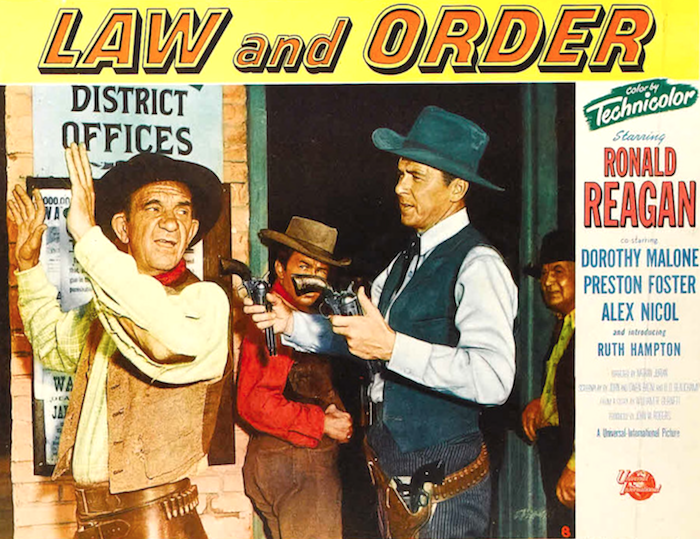 50s Westerns Blu-Ray News #276: Law And Order (1953). | 50 Westerns From The 50s. « Screening: The Searchers (1956) In 35mm. Politics? The last popular and successful president. I always liked Ronald Reagan and “LAW AND ORDER” was the first western I ever saw on the big screen. Mum & Dad took me to see it (probably in 1954) and probably didn’t realise in advance that it was going to be quite violent for a 6 year-old but it didn’t phase me one bit. I LOVED it! I’m looking forward to this as well!!! Great stuff. the supporting cast is top notch. also reduced the price from what they normally charge. stated that Shout Factory are cleaning him out finance wise but he’s loving it! I certainly hope so if they want more of the same from Shout Factory. I’m guessing this won’t have all the extras that the monster stuff has, which would drive up the price. (I’d sure love to do a commentary on this one.) I agree, sales of this one will help determine if anything comes next. Their Deadly Mantis and Mole People Blu-Rays are beautiful. I’ve watched them both at least twice. Man, I’d love to have Curse Of The Undead on Blu-Ray. This is a great movie. I already have it on SD DVD and it looks pretty darn good, so the Blu Ray should be awesome picture quality. I do agree with what John K said about Reagan in westerns, but he’s good in this one. I have LAW AND ORDER on DVD ,so I won’t be double dipping ,but it is good that they are releasing more 50s westerns .I just wish that some of these companies would follow ESC Editions lead and release some previously unreleased westerns.My order from them should be arriving very soon. BANDOLERO is up for pre order on May 8th and release day is May 21th.Mike Finnegan from Twilight tells me there won’t be any extended hangman’s scene ,but the extras include an isolated track of Jerry Goldsmith’s score and a new commentary from Cinema Retro’s Lee Pfeiffer and Paul Scrabo .He also sent me a copy of Roger Ebert’s 1968 review in which he says”heaven knows what happened to the unhappy hangman”,which suggests that it wasn’t included in it’s initial release. I have a version of this from Hollywood scrapheap but I will be double dipping this for sure as I really like this movie. Wish they could pair it with the Walter Huston version from the 30’s – now that would be. great double bill. Lyson ,both of these films are on a double set from Sidonis Calysta which I have. Thank you Graham – what do you think of the PQ – I am looking forward to a blu-ray version. In my mind I am only double dipping for movies I really like (as opposed to just like) and are a big improvement over the DVD but in reality I’m not that disciplined e.g. getting the new Bend in the River which per Robert Harris is a PQ disappointment but I’m sold on having a Toby commentary! Also guessing Sidonis is not going to work because I don’t have a region free player – I’ll check it out though. Lyson ,the PQ on LAW AND ORDER from Sidonis is acceptable.In order to enjoy the films we love you need to convert your DVD player to multi region.I converted my first DVD player to multi region by going on line and inserting the numbers in .If you are thinking about BLU RAY ,then you are better off investing in a multi region BLU RAY player and you have the best of both worlds.I bought one ,but my reason for doing so was because some releases were BLU RAY only,otherwise I would make do with a multi region DVD player.I hope that WB makes this 60th Anniversary RIO BRAVO release worthwhile,otherwise what’s the point. Readers here might be interested to know that Hollywood Scrapheap has just released the Rory Calhoun western “RAW EDGE”. The film is only previously available via a Spanish issue, I believe. The HS release is in 16:9 widescreen and the transfer certainly looks excellent. I agree with Graham, in that I wish we could see more releases of previously unreleased Western movies. Also, I would like to have heard commentary from Raquel Welch and Andrew Prine on BANDOLERO! (1968), but we take what we can get. Nancy Gates passed away at age ninety-three on March 24, 2019. She was a much talented actress. Fans of this site will remember in Budd Boetticher’s COMANCHE STATION(1960) with Randolph Scott. I missed the news of Nancy Gates’ passing, Walter. Thank you for bringing it to our attention. For me, Nancy was a most appealing actress who graced a number of films I like. Her first ‘splash’ perhaps was as the lovely leading lady in the 1948 PRC western “Check Your Guns” starring Eddie Dean. Jerry, we missed the news of her passing, because there wasn’t any, until I read it in the THE TELEGRAPH, which was dated April 12, 2019. IMDb still doesn’t have her passing. She was in some really good movies and TV shows. I recently saw her in a fine episode of THE LONER(1965-66) a Western series starring Lloyd Bridges, which was created and written by Rod Serling. The episode was “The House Rules at Mrs. Wayne’s” which aired November 6, 1965. It was written by Rod Serling and directed by Allen H. Miner. Thanks for that link to the Daily Telegraph, Walter. Back to the hangman in BANDOLERO! The rest of the scene was there, recalling viewed in a 16mm print in ’68. The 2nd time I saw it in a theatre years later, the conclusion of that scene was axed out in a rather a swift cutaway shot if you’ll notice, I questioned as to WHY it was cut, because it left the audience believing Stewart murdered the fellow to take his place as the hangman, and that was NOT something our cowboy heroes did in ’68 . We didn’t have to wait very long, though, for Henry Fonda to break the mold with his repulsive role in the equally repellant ONCE UPON A TIME IN THE WEST….and thankful that THAT film is NOT one of our cherished ’50’s collection! DITTO for ALDO RAY IN WELCOME TO HARD TIMES, ’68–HF in that one too. Not that any of this matters to the world, just remembering some things we left behind pertaining to American Cinema which changed almost overnight–in 1968.
stevens733 ,it is a mystery as to why they cut it,after all it would have only been a few minutes and would have solved the mystery if Stewart murdered the hangman or not .Anyway,check out Roger Ebert’s 1968 review.By the way,did you see Guy Raymond who played the hangman in THE UNDEFEATED .He plays D J Giles where he says to Wayne “wait a minute ! I didn’t do anything” to which Wayne replies “You should have” then punches him. Hello, gcwe1! We’ll find an answer-somewhere! At the most, the rest of the scene could not have been over a minute-This BANDOLERO! scene cut was probably footage count with seconds, perhaps STILL inside the time frame total of 108min. Every repeated viewing since I STILL GET A HUGE wtf? reaction from myself , especially because this case of a scene cut was crucially important in character descriptions of BOTH of them. re/UNDEFEATED– I love Wayne and Hudson (and whatta cast!) in THE UNDEFEATED, but I could never find a total liking for it. I think an EPIC was planned, but I think that the massive undertaking of it all probably defeated the whole result–much like the director’s THE WAY WEST, ditto reaction from me ). BTW that scene you mentioned in UNDEFEATED, is my favorite in the entire flick! The movie must have been a real let-down for the folks who made it,; I think it rides low in the popular ratings in both camps of WAYNE or HUDSON’S films. Perhaps the fault was the script-tampering? I wonder if the upcoming commentary by Cinema Retro’s Lee Pfeiffer and Paul Scrabo on the Twilight release of BANDOLERO! (1968) will have any information on the missing cut footage of what happened to Ossie Grimes, the hangman? The movie’s length is 106 minutes. So, it wasn’t cut because of the length. I’m sure fans of the TV classic STAR TREK series will remember Guy Raymond as the trader/bartender in the episode “The Trouble With Tribbles,” which aired on December 29, 1967. Walter ,if you have seen this missing scene ,what was the hangman’s fate? Graham, I haven’t seen the International version of BANDOLERO!, but stevens733 has, and the missing scene was in that version. I’ve read Arnold Hano’s novelization of the movie BANDOLERO! based upon a screenplay by James Lee Barrett from a story by Stanley Hough. The novel gives the fate of the hangman, which wasn’t death. I commented about this back on November 29, 2018 on Toby’s “Happy Thanksgiving” post. Walter,I’ve no doubt that stevens733 has seen the International version of BANDOLERO ,but he must have seen it in a theatre because I’ve checked out plenty of International DVDs and BLU RAYs of this film and they all run for 106 min,some even a little less .Do you know if the Kino version of FOR A FEW DOLLARS MORE is the uncut one?My version runs the same time .They say the German BLU RAY is uncut ,but it too runs the same time. several years back as a Koch DVD. ’em up Western with a nasty Dean Martin and an even nastier Slim Pickens. John K, I first saw ROUGH NIGHT IN JERICHO(1967) on the ABC MONDAY NIGHT MOVIE in 1970. It’s a good entertaining Western released by Universal Pictures. I think Dean Martin played the heavy rather well and brings it off. George Peppard plays the ex-deputy/gambler in an effectively cool manner. I wonder, what if Dean and George had switched roles. That could have been interesting. I wish Jean Simmons had made more Westerns, because she was good in them. I agree this Western seemed like it came from the 1950’s with some brutality added by way of Slim Pickens. The knock down drag out fight between Slim and George is really memorable. Slim could portray a badman, as we know from ONE-EYED JACKS. This movie had some good performances. Well worth watching. The source material for the movie was a 1965 novel THE MAN IN BLACK written by Marvin H. Albert using his pseudonym Al Conroy. Albert also wrote the novel THE LAW AND JAKE WADE(1956), which was made into the movie of the same name. Kino’s Blu Ray of BEND OF THE RIVER. EARTH which he hopes will be an improvement over the Euro version. French.Elephant Blu Ray is possibly as good as it’s gonna get;lets see. whereas in the exterior scenes the French Blu Ray looks stellar. wonderful as does NIGHT PASSAGE and THE RARE BREED. Other Universal Westerns have not fared so well notably THE LAST SUNSET. THE SAGA OF HEMP BROWN and in particular DAY OF THE BADMAN. thus far unreleased (domestically) CURSE OF THE UNDEAD. COULDN’T DIE,certainly the DVD version was nothing to write home about. John K, always more than happy to stay on a Universal Westerns kick. I commend Universal Pictures for releasing traditional Westerns into the 1970’s. Producer/director George Seaton’s SHOWDOWN(1973) was an almost forgotten traditional Western until it was finally released on DVD in 2011 as part of the Universal Pictures Home Entertainment Vault Series. I hope this underrated Western starring Dean Martin, Rock Hudson, and Susan Clark lassos some new viewers, because of the recent German Blu-ray releases. Is it a great Western? No, but it is a pleasant telling of the tried and true Damon and Pythias story about two childhood friends ending up on different sides of the law. It is beautifully shot by director of photography Ernest Laszlo and with a potent finale. I first saw this movie in 1974 on NBC-TV and I liked it then and I still do. I realize that when SHOWDOWN was first released, it was considered old fashioned and out of step, because it wasn’t an anti-Western. Well I tell you what, that is just fine with me. In my opinion, it’s important to shine a light on good movies that have been forgotten, or never known. Western Movies like SHOWDOWN deserve to be remembered just as much as the more famous movies. Graham, it looks like we are stuck with the 106:28 cut of BANDOLERO! on DVD from anywhere, at this time. Disney now owns 20th Century Fox, so the powers that be at Disney now control what is in the film vaults at 20th Century Fox. So, who knows. I’m sure there are others on this site that know much more than I do about the Kino-Lorber and the Universum Film versions of FOR A FEW DOLLARS MORE. From what I know the Kino-Lorber version images are really good, but this version is close to one minute shorter in length than the Universum Film German Blu-ray. The original Italian censorship documents have been made public and state the German release was uncut. Although, there are some tiny frame differences here and there in the German cut from the Italian cut. Walter,I don’t know if it’s my imagination ,but I’ve noticed on some German releases they love to put the word uncut on their DVDs and BLU RAYs when they are the same running time in most places .I don’t know if they think that will get them more sales. I never really liked ROUGH NIGHT IN JERICHO or Dean Martin as a nasty,but at least he was expanding his acting range.I did read where he loved making westerns. Graham, I’m not surprised about some DVD’s claims on their covers about being uncut and it turns out to be false. Although, the Universum Film German Blu-ray has the uncut footage of the scene where Clint Eastwood and Lee Van Cleef are being beaten up by Gian Maria Voltonte’s gang of bandits. It is an extra 44 seconds. Euro western fans looking for complete uncut versions should avoid the UK releases, as most are trimmed for horse falls. Even the new splendid Arrow Blu ray of Lee Van Cleef’s The Grand Duel has a few seconds missing. Walter,maybe the reason they put uncut on the cases is because their release was cut .Who knows. Kino has now indicated they will be doing MAN WITHOUT A STAR. made more Westerns,and as you quiet rightly say she was good in them. Jean and Rory make a most attractive twosome,to say the least. Explosive Blu Ray’s are normally region free. widescreen transfer so that bodes well for the forthcoming Kino version. up until HIGH PLAINS DRIFTER,possibly a bit beyond in the case of the latter. of Universal’s B unit productions. BADLANDS OF DAKOTA and KIT CARSON arrived from ESC yesterday .It’s good they are releasing some of these old westerns The transfers weren’t bad but KIT CARSON had a few spots here and there .It would have been hard to get a descent print .I was pretty sure I already had this film ,but I turned my collection upside down before ordering but could not find it .ESC have GERONIMO and CALIFORNIA with Ray Milland up for pre order so they’ll be next on my list .I can’t see anything else of interest for me on the horizon other then RIO BRAVO 60 th Anniversary and even that might be a let down.